김현진, 박병준, 정선호, 이다솔, 정해도,(2019).CMP에서 패드 돌기와 산화막 패턴의 접촉 모드에 따른 평탄화 모델링.한국정밀공학회지,36(4),363-372. Chemical Mechanical Planarization (CMP) is an indispensable process of forming multilayer integrated circuit. However, it is necessary to understand the pattern in order to achieve global planarization. Material Removal Rate (MRR) depends on the pattern density in the actual CMP process and is required to predict the MRR according to density of the pattern. Based on the Preston equation (CMP governing equation), the MRR can be expressed as a product of pressure, relative velocity, and the Preston`s coefficient. Therefore, understanding of pressure distribution acting on the patterned wafer is essential. Pressure distribution depends on contact area between pad asperity and wafer surface. 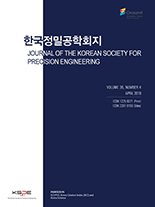 In this study, pressure distribution according to contact mode between asperity and wafer surface where step height exists was analyzed, and the planarization model presented. Finally, a comparison was done between the mathematical model and the experimental data, and the planarization model was verified.